In the past months, there’s been a surge of “launcher apps” – lightweight utilities that allow iOS users to perform common tasks such as calling someone or starting a FaceTime call without having to use Apple’s apps, and thus their entire interfaces. However, while the concept of launchers and shortcuts has been around for years in the App Store – especially on the quick dial side, apps like Favorites first explored the idea of turning contacts into shortcuts – several of the utilities we have recently reviewed have leveraged the simplicity of such concept to build more powerful solutions to help users save time. With a combination of clever interface designs, new APIs and URL handlers, apps like Launch Center, Buzz, and World Contacts+ are redefining the way users think of interoperability and customization on the iOS platform. App Cubby’s Launch Center has especially gained a well deserved spot in many’s iOS dock thanks to its extensive support for third-party apps and a polished UI. For the past week, I have been able to use Agile Tortoise’s Drafts, a new iPhone app that’s like "Launch Center for text" – a utility that allows you to save short snippets of text – the drafts – and act on them by sharing them through a number of services or system actions. Drafts is very simple. Surprisingly so, if you expected to find options to enter custom URL handlers for apps that are capable of accepting text inputs. In fact, my mention of Launch Center is only theoretical, as both utilities share the same underlying ideology – to aggregate a set of actions and supported apps for a specific input into a single interface – but the first version of Drafts doesn’t come with the same amount of customization and tweaks you can find in Launch Center. Still, when it comes to text, Drafts has proved to be an invaluable addition to my workflow that, like Launch Center, got its spot in my iPhone dock. Drafts saves snippets of text. The app displays a word & character count for these snippets, which can be saved locally and accessed at any time by hitting the drafts icon in the app’s toolbar. Because Drafts 1.0 is iPhone-only, iCloud support hasn’t been added yet – your snippets won’t be synced across devices. You can search for any word across your drafts, and add new ones by simply pressing a + button. In the Settings, you can set the app’s Appearance, choosing between 13 fonts (American Typewriter, Baskerville, Cochin, Courier, Georgia, Gill Sans, Helvetica Neue, Hoefler Text, Marker Felt, Palatino, Times New Roman, Thonbury, and Verdana), three font sizes, and four themes. I chose Grayscale. You can use Drafts as a notepad, a scratchpad of sorts, or a draft manager for your tweets, much like the defunct Birdhouse used to. Drafts sports a nice integration with Twitter, enabling you tweet natively using iOS’ support for Twitter, and letting you directly forward text to Tweetbot or the official Twitter app. If you choose to send text to these apps, the compose screen will open with the text already pasted, and you will just have to hit Send to publish a new tweet. I suspect support for more Twitter apps is coming in a future update. Drafts isn’t just about Twitter, though. You can pick a draft, and email it to someone using the native iOS mail framework. You can copy a draft to the system clipboard, or, if you like to write in Markdown, preview the formatting, copy the Markdown to your clipboard, or email it. Being a huge fan of Markdown (which I use on a daily basis for my writing on MacStories), this is a nice addition. 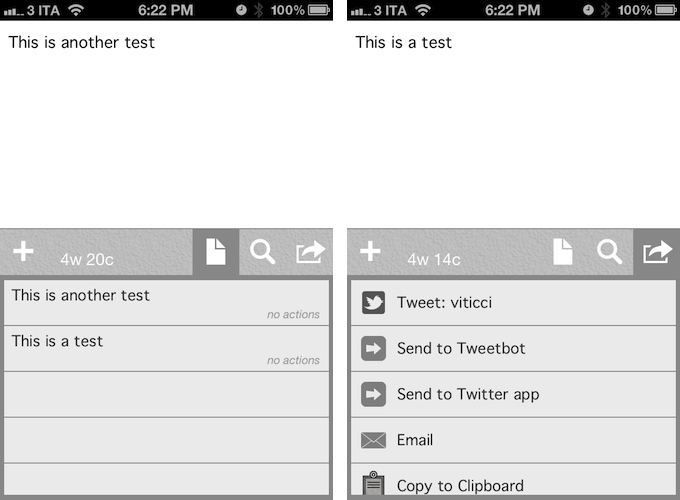 Drafts is neither a text editor nor a minimal Twitter client. Drafts is a frictionless way to capture and save ideas that also happens to be integrated with system functions and applications you may be already using to elaborate on those ideas. Drafts can be used as an inspirational notepad to store the genius idea you have while you’re brewing coffee, or when you're busy writing something else (just fire up Drafts, and quickly dictate your text if you have an iPhone 4S). I would like to see an even faster way to email text (like Captio or Note 2 Self do) as well as support for Evernote and more text-based iOS apps in a future update, so here’s to hoping the feedback on this initial version will be strong enough to encourage Greg Pierce, the developer of Drafts and Terminology (which the app also supports for definitions), to consider more functionalities and an iPad counterpart. In this first version, Drafts supports TextExpander touch, but there is no option to forward text to Apple’s Messages app. Drafts 1.0 is a very good start, especially if you’ve been looking for a standalone draft manager for Twitter. You can get the app at $0.99 on the App Store.